Other interesting board is this board from Electronic Gadget World, a shop on aliexpress.com. 1. Development board with ESP8266 module and power supply. The parcel contained one ESP201 an SDK Development board and a DHT11 sensor. No cables or power supply. I've ordered two extra ESP201 so I've replaced the faulty one with a good ESP201. As you can see in the image there are two USBs. The microUSB located on the top right is just for powering the board. The other usb, a type B USB can be used to power the board, and to write firmware to ESP201 flash. The usb to serial on board is a CH340G chip. My win7 didn't complain about it, I was able to write the flash to ESP201. The only problem is that the transfer was done at 9600 or less (like 5 minute for 200k), after I've modified in the DeviceManager the speed for the port, the transfer rate was increased. But this happened only once, so I gave up using the CH340G chip for now. I've removed the red jumpers and I used my old Prolific USB/serial. I'll reinstall the drivers for CH340G chip with this one later and I'll see if helps. a variable rezistor for ADC ( on the left of relay ) connected to ADC pin. a main switch in the right upper corner (this switch is just for ESP201 board I guess, I have the impression that the CH340G is still receiving power even the switch is off). R - should be the RED led from the RGB connected to the IO15 pin. Putting the R DIP to ON will light RED if the GPIO15 is HIGH. G - GREEN led from RGB led is connected to IO13. Putting the G DIP to ON will light GREEN if the GPIO13 is HIGH. J - relay pin connected to IO16 ( which is always HIGH - I have no idea why . This behavior and the RED led that is not working can be because I have a bad board or the design for all the boards is wrong. Connecting the IO16 to GND (not recommended) will stop the relay, otherwise it will be ON all the time the J DIP pin is ON. B - BUZZER connected to IO5 pin throuch B DIP switch. Having GPIO5 HIGH and B on DIP switch ON will prove that the buzzer is working. K2 - I assume is connected to S3. 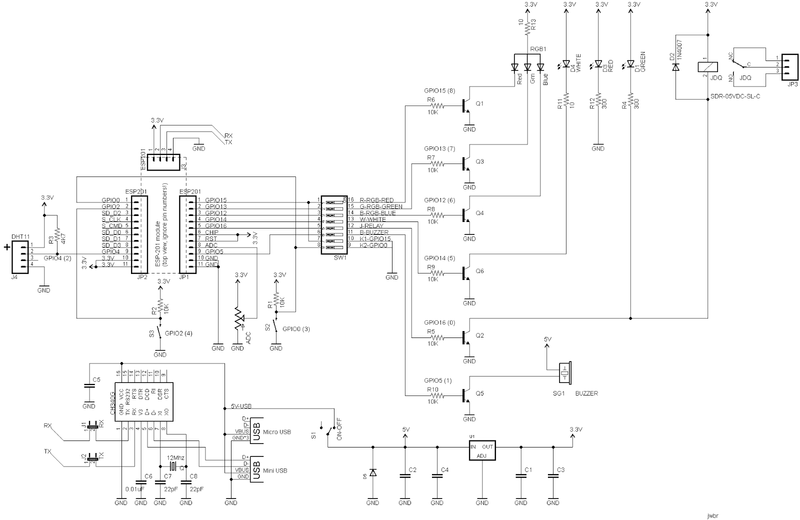 And thanks to Scott Snowden and jwbr from http://www.bpower.nl/ there is a complete schematics of the board. On IO4 is connected the DHT11 sensor. I didn't use it because I have a DHT22 which is more accurate. 2.Keep S2 pressed and power on the board using the switch located in the right top of the board. 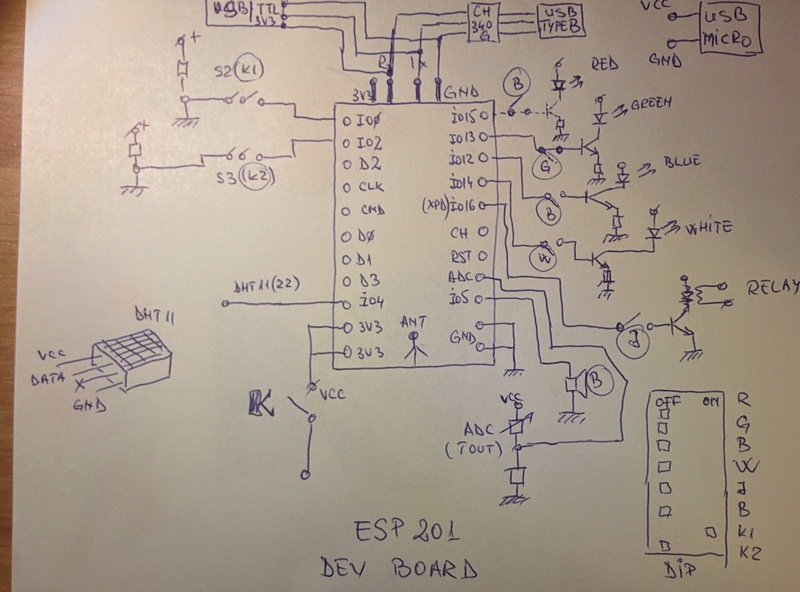 3.Now you can write the flash from the ESP201 board. It is a very good board, no issues found. 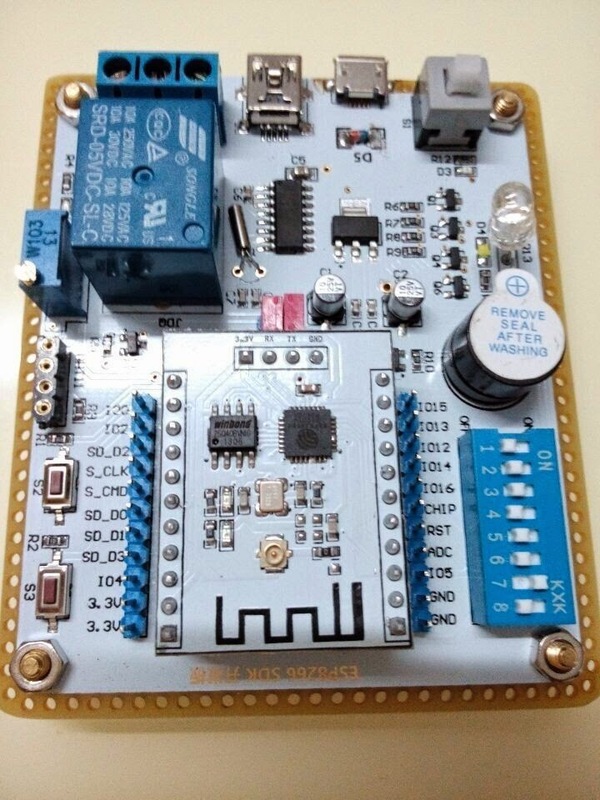 If you want a rapid development board you can buy this one. And the final config will look like in this picture (2 external relays, 2 external LEDs DHT22). Pretty crowded. Breadboard is just for GND. UPDATE3: A IoT plug based on ESP-01 - HERE. A lawn irrigation IoT based on this board is coming soon. UPDATE4: Now I have a unix cron functionality on my ESP8266 chips. Hi can you help me with the use of this board via wifi? Hi Paolo what is the problem. Do you have the board ? yes i have the board! I'm able to connect to its wifi , but how i canon a web service with browser? how i can send commands to boards ? For the AT commands you can see the linkhttp://wiki.iteadstudio.com/ESP8266_Serial_WIFI_Module. Also if tou have the latest SDK there is in it a directory name documents where there are manuals for AT commans. Personally I am not using AT commands, I am writing my own software that receive commands from via my broker. I am controlling plugs, security monitor with PIR, irrigation control with relays. i have installed nodemcu firmware but i'm not ready to set pin high !!! can you help me? 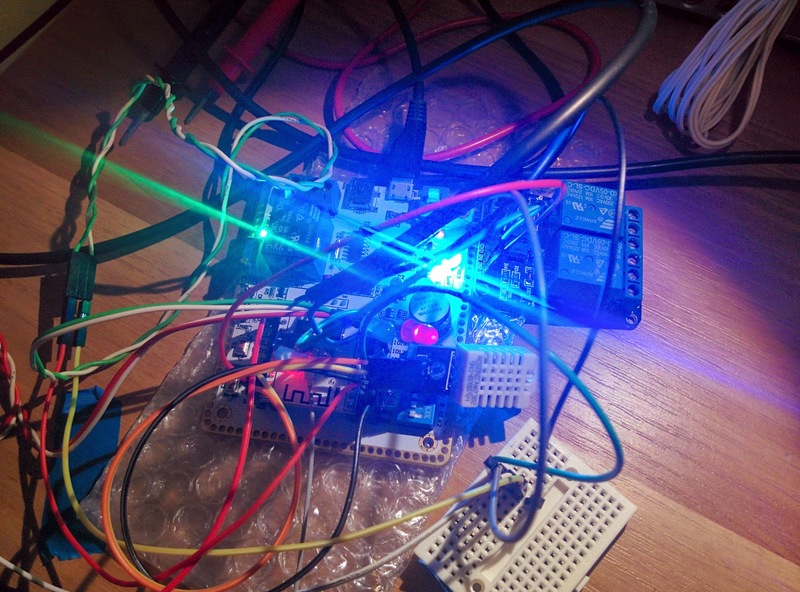 Alternatively you can use the http://myesp8266.blogspot.ro/2015/03/example-blink-led.html but this will be without nodemcu. but when i try to set high any pin i have no response from board. the deep switch work correctly. i don't understand!!! can you test it with me? Sure, send me an email and will continue discussion over there. Thanks for the informations provided in yours blog! Cool. Let me know about your project with ESP8266 board. Please share with us your findings. Can someone explain the DHT22 code. How do I get this to work with the module. I understand the code is in. 2 parts. Does the first one need to be saved as init.lua and the second dht22. Unsure as to the process to make it work. So do you simple code for this board? like a blink code or such? I am not even getting the correct gpio for the 201 circuit using the NodeMCU firmware for Lua Uploader. So basically i cant figure out the gpio's are correct or not. more info in the esp8266.com forums. There is a bug on this board as the potentiometer can send 3.3V direct to the ADC wich must be 0 - 1.0V. You have right ! Cool finding. I'll modify my board too. According to Kelly from Espressif ( producer of the ESP8266 chip) the analog input can handle 3.3V. Analog and PA Power Supply(Pin 1, Pin 3, Pin 4, Pin 29, Pin 30):3.0V ~ 3.6V." Has anyone found the resolve for GPIO16. LuaLoader says it does not exist??? esp201 is having the AT firmware by default. I am using 115K as baud rate. The init is at 75. Why do you need to control a led with arduino when you can do it with esp201 itself ? If you want to connect arduino with ESP connect the serial interfaces together. Hi, I have the same board. When I connect load to relays (220v), the relay flikers quickly between on and off a few times when I turn it off, then it turn off. Actually, all the board flickers (rgb led,...). It works as expected without load. Have you idea of the reason? Thanks a lot. What is the output current for your power supply ? I tried some power supply, 2A also. Thanks for your reply. Try to power the board not through USB connectors, but directly to pins around the ESP201 module. BE SURE THAT YOU ARE USING 3.3V NOT 5V. It is possible that the on board converter (5V to 3.3V) not supplying the current requested by the board and relay. Can you measure the current ? I digged better on internet and I found the problem could be the inductive load. The relay has to drive a electric valve (inductive load) and it could give spikes to the board (if there is no snubber). I used a light bulb instead and it works. Thanks! I tested the dht11 holes with ds18b20 (OneWire) and it works. Great article ! I would buy this board but before I need to know the exact dimensions (height x width x depth) because of the constrains of the project. Could someone send me this infos ? what board name and programmer should I choice in Arduino 1.8.2? On my 201 board Mini and Micro USB Boards are in parallel - both can be used for power and communcation. Uploading using the USB-Port (Mini or Micro) can be done with my board at 74800 bd, both K1 and K2 have to be ON during power-up for loading. I switch on the board when compile has finished and loading starts. Both switches my be set to OFF after loading has started. If only K1 is set, the board is in boot flash mode - used together with the espressif loader.